When we first took in Buster the Chihuahua as a foster, he was very anxious. He paced around the house, barely slept, and was constantly on edge — even dashed out the door more than once. It was hard. I found myself second-guessing my skills as a dog trainer, and wondering what I had gotten myself into. Does your dog have the same issues? Do you feel like I did? Well, fear not. With a little patience you can help your new dog adjust to his new life. Get your new dog into a predictable routine, which means eating, walking, and sleeping around the same time every day. At home, playing with your dog is a great way to bond, and is just plain fun, not to mention a good distraction from some of the more stressful moments. 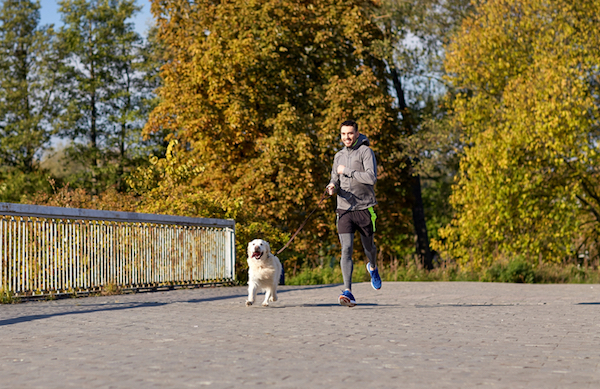 Man running with dog by Shutterstock. One-on-one exercise time with your dog strengthens your relationship and provides fresh air and exercise — a proven stress reliever. All dogs have different exercise needs, but start with 20 to 30 minutes once or twice a day and see how that works. Some dogs need a little more help to ease their anxiety. Try calming treats or supplements made with natural ingredients like tryptophan, chamomile, brewer’s yeast, B vitamins, and hops. ProQuiet is available on Amazon.com (and at some vet’s offices), and my vet describes it as a turkey sandwich and a beer for dogs. Bach’s Rescue Remedy for Pets is made from flower essences. Put a couple drops in the water bowl or on your dog’s paw. Studies have shown that petting animals can reduce stress, and if your dog likes touch, it can be a great way to calm both of you. Above all else, remember that it takes time. Be patient and give your new dog time to adjust to his new home. If your dog’s anxiety or behaviors are extreme or unmanageable, reach out to a positive-reinforcement trainer for help. And Buster? He eventually settled in and found his forever home (with us)! The post How to Help Your New Rescue Dog Relax and Feel at Home appeared first on Dogster.